Deliberately taking my mail, so as to slow down my towns growth. Full load on city roads, so I did the same using to lorries to get the mail he was taking we would have a nice traffic jam. Admin was called, but as it happend.... I won the game anyway. You are a chat BadUncle. Shame on you. - The use of those stations, without delivering the cargo to his claimed town can be seen as a clearly sabotage action to the other player (you), and directly violating rule 5. ...so I did the same using to lorries to get the mail he was taking we would have a nice traffic jam. I didn't do it to take revenge. I never full load on shared streets as I don't agree with it. With him already using full loads... it causes a traffic jam. I did it so he would be violating rule 5 clearly. Shameful behavior, just to delay my win. I personally do not think you should be working the system to force him to be in violation of a rule based on a possible oversight by him. I thought you weren't allowed to use full load in towns anyway though regardless? 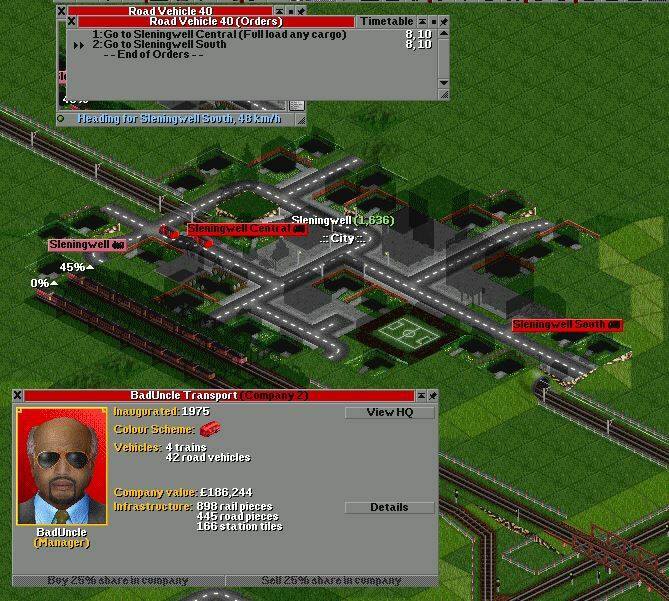 Copyright 2018 BadUncle - BTPro - OpenTTD Community.